There’s no denying that pay-per-click (PPC) is an important tool in the B2B marketers toolkit. Recent surveys have indicated the 49 per cent of B2B organisations are increasing investment in PPC, yet only 57 per cent find it a ‘somewhat effective’ marketing tactic. 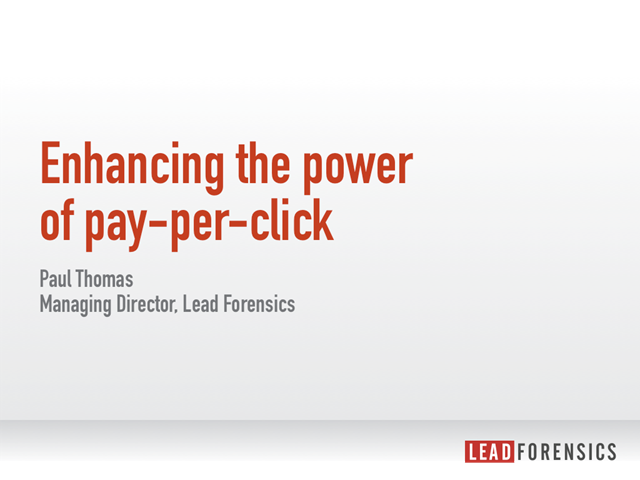 Paul Thomas, managing director of Lead Forensics, will demonstrate how you can enhance the lead generation potential of your PPC campaigns by uncovering web leads you didn’t know you had. Hear how other B2B organisations are utilising advanced insight to increase their PPC return-on-investment and making PPC one of their most effective marketing tactics. * Demonstrate PPC effectiveness through improved ROI.